Happy Friday, everyone! It’s been a busy couple of weeks and if you follow me on Instagram, you know that I hit a couple of setbacks with my shop. We had ordered all the ingredients, packaging, and labels for my body butter, only to find out that summertime is NOT a friend of homemade body butter. I sent some samples out to friends and it arrived melted and/or soupy…so, far from the whipped body butter it was supposed to be. I literally wanted to throw in the towel because we’re tapping into savings to get this up and running – I felt defeated. Thankfully I have such a great support network that I didn’t stay in a funk for too long. So…I quickly began working on the next couple of products to be available. The body butters will be in the Etsy shop this September or when the weather gets cool enough to ship them. For those who follow me on Instagram, I apologize for repeating some of this information. For the last five or six years, I’ve been making my own deodorant and love it, but within the last few months, I have come across people who have a sensitivity to baking soda. Some people break out in a rash or it is too drying for their skin – even with the raw coconut oil. The problem that I ran across with this specific deodorant is that it would melt in the warmer months, making it a messy challenge to apply. So, I began experimenting with a spray deodorant – tested out different ratios of oils and created a safe and effective deodorant that was baking soda free! All of the above have been linked to cancer, Alzheimer’s disease, several other health issues and can be a hormone disrupter. I’m honestly amazed that these commercial deodorants are still on the market…or that people still use them on a daily basis. You won’t find any of the above ingredients in my spray deodorant – just two ingredients – all natural, safe, and non-toxic. Witch hazel has natural skin healing, anti-microbial and anti-bacterial properties – making it a safe and effective deodorant. Tea tree oil (one of my favorite options to add into the deodorant) also has anti-microbial properties which helps to destroy the bacteria that causes body odor…same goes for lavender and lemon essential oils. For those who prefer fractionated coconut oil as opposed to alcohol-free witch hazel, I have that option available. The deodorant is packaged in a 1oz amber glass spray bottle – larger sizes (2oz, 4oz) will be available soon. 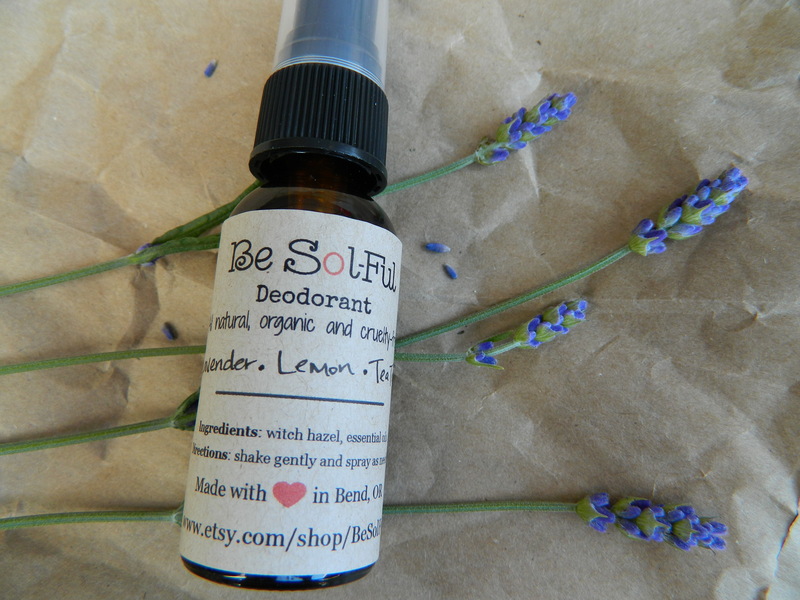 One of my favorite blends for this spray deodorant is Lavender-Lemon-Tea Tree. Another product that I’ve just listed in my Etsy shop, is an all natural perfume using just organic sweet almond oil and essential oils of your choice. I used to wear perfume growing up (and in my early 20’s), not realizing the harm I was doing. They were the cause of most of my headaches/migraines AND they were loaded with ingredients that I couldn’t pronounce. Did you know that, on average, 14 secret chemicals can be found in fragrance products?! And that’s not including the already lengthy ingredient list. Click HERE to learn more about toxic perfumes. Two ingredients. That is all that you’ll find in my little roll-on perfume. It may not last all day long like the commercial perfumes, but that is only because I do NOT add any synthetics – just high quality essential oils and organic sweet almond oil. They provide a subtle fragrance and can be applied as needed. For those who are not a fan of almond oil, I can make them with fractionated coconut oil. Like the deodorant, you have a list of oils to choose from and I will gladly make a blend, too. 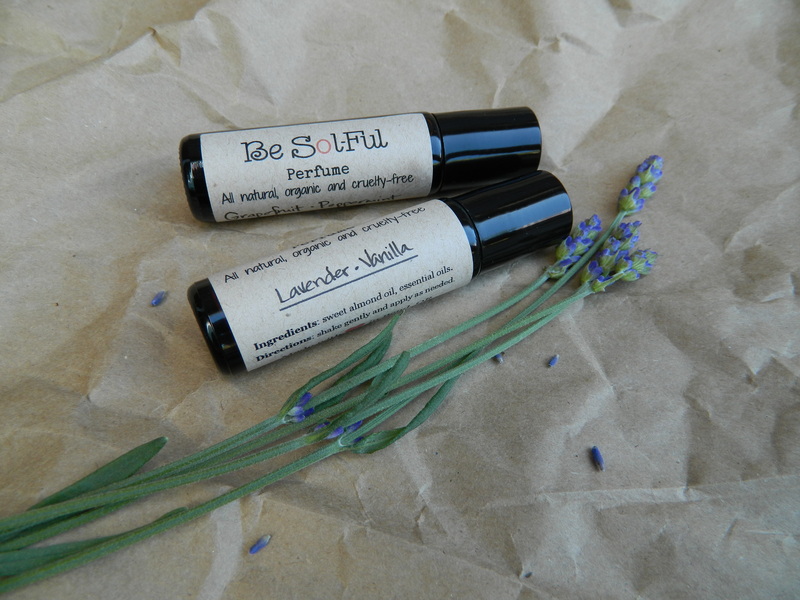 Just two examples of perfume blends: Grapefruit-Peppermint and Lavender-Vanilla. In the next week or two, I will have some specialty scents available for headache relief, anxiety, depression and grounding. So, please stay tuned! Hi Mandy! I have a question about your deodorant. In your blog post you mentioned your favorite combination. Is that the “deodorant blend” scent in your shop? I want to order the one you like best. I really appreciate this post because I really had no idea how toxic the deodorant I am using now is! Thanks! I’m so sorry to take so long to finally comment on this post…I’m completely chaotic and forgetful. Anyways, I am in love with the lavender-vanilla perfurme…omg, 2 of my favorite scents! Going to order some today! I can’t wait! I stopped wearing perfume as well after learning how dangerous they are. Oh and as you know, I absolutely love your spray deodorant and I agree, that sweating is healthy. I just hate to sweat under my armpits, lol! It feels gross and I sweat SO easily in the summer, so it definitely is a personal issue for me. I don’t leave the house everyday though, so it’s not something I wear all the time and I do use a vegan brand that is aluminum-free and not completely filled with garbage. Ok, off to order your perfume. So glad you have this shop!